1. I found this little snapper when I was running one day. Partially buried in the dirt, I thought he was a walnut until I noticed the spine ridges. 2. My friend Lisa came to visit for a few days, and I didn't realize until she arrived that she was on a paleo diet. We don't eat a ton of meat so I was kind of at a loss about what to feed her. But then I chopped up one of my huge blue hubbard squashes, and it saved the day (along with a cabbage and kielbasa stir fry). She liked it so much she even took some home (and since it was so big, there was plenty left over). 3. I spent some time getting recertified for CPR recently. It's a requirement for one of my jobs, and I think it's an important skill to have. I'm good for the next two years now. 4. This weekend is GoFest in Roanoke. I have blogged about it a few times. Always a really fun festival - if you are local check it out. 5. Our two guineas are 15 weeks old today, so maybe with a little luck we will see an egg soon. Assuming, that there is a female in the mix. Linked with Willy Nilly Friday. adorable little prehistoric being. :) happy weekend to you and yours! I have found those turtles in my garden after eggs hatched where they were buried. Not so many now after building the palletsade but they can still dig under it once in awhile. They go down the creek only to come back as adults. I need to go look for sweet potatoes in the garden before the freeze this weekend and also bring in any butternuts still hiding. 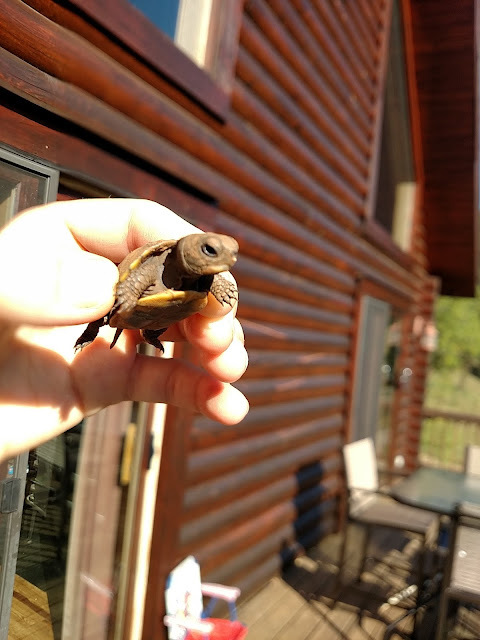 i found a tiny snapper about that size a few years back, so cute! i showed him on my blog too! yes, i just saw about gofest this morning...we'll probably head over there, it has sure grown since the first one! there is also a wounded warrior softball game that i want to go see tomorrow...finally a rain free weekend!! that dinner sounds yummy! thanks for linking lisa and have a great weekend! LOL I thought you were going to say you guys ate the turtle lol. My friend and I have so many food allergies between the two of us and then throw in I am vegetarian we get tickled trying to fix meals everyone can eat when we get together LOL. I'm in love with your little turtle. Turtles make my heart happy! I want to get certified again for CPR. I think it should be a requirement for my job. Sadly it isn't. Such a cute turtle...I swear I have heard of that diet so many times and even had a daughter on it, but cannot think what it is right at this moment. Need to look it up. But first going to glance back through this blog to see if I see pic of the guineas anywhere! Oh my GOSH! That little turtle is adorable!! Nice that you saved him. I'm sure it is getting to be hibernation time for that little guy. How fun to find a baby turtle! You are very busy there, lots of good things it sounds like. #2 Sounds good to me. #3 I wish that I knew CPR. #4 Have a great time. #5 What are the chances that there isn't one? a walnut comment that gave me a chuckle...what a a cutie! I found a baby snapper and a baby painted turtle once walking side by side. And I didn't have my camera! Oh he's adorable..so tiny! You have good eyes, Lisa. My daughter is a school nurse and she certifies the teachers in CPR...I have done that twice...way back when I was a teacher...it is a good skill to know. You're lucky the little Snapper didn't take a chunk out of you. What a cute little turtle! Special diets are a pain! I have food allergies plus have to eat a certain way for a pre-diabetic diagnosis and another way to control reflux, plus I try to keep my weight down and my bones strong. It's difficult. Such a cute little turtle! I'm required to take CPR recertification every two years for my job as well but I can't tell you when it's coming up. And a Paleo diet! I hear that. I might be making my way into one -- but we do eat loads of veggies, so sounds like you did great. The little turtle is adorable!! We're doing mostly paleo too; I tend to go heavy on the veggies in lieu of meat too. You remind me... I need to check my window wells. Every year the snappers try to bury themselves in the mud for the winter.